Fifa presidential candidate Gianni Infantino says he will withdraw from the race if suspended Uefa boss Michel Platini is allowed to stand. 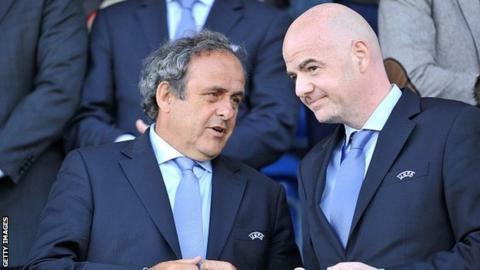 Platini and outgoing president Sepp Blatter are under investigation over a payment made to the Frenchman by the Swiss. Both men deny any wrongdoing. Seven candidates are bidding to replace Blatter, who is also banned. Fifa may permit Platini's bid if his 90-day ban ends before the election on 26 February. "My candidacy is not in opposition to Michel," Infantino said. "If he is able to stand, I will withdraw. It's a simple principle of loyalty. "But right now I am a candidate 100% and I'm moving forward, not only for Europe but for world football." Infantino, 45, has been the general secretary of Uefa, European football's governing body, since 2009 and was backed by the organisation's executive committee to stand for election just hours before the deadline on 26 October. Platini had already announced his intention to stand but his candidacy depends on the outcome of a Fifa investigation into reports of a £1.35m payment made in 2011 for work he did as Blatter's adviser. Alongside Platini and Infantino, Asian football leader Sheikh Salman bin Ibrahim al-Khalifa of Bahrain, Prince Ali bin al-Hussein of Jordan, former South African politician Tokyo Sexwale, Liberian federation president Musa Bility and former Fifa official Jerome Champagne have all submitted official bids for the presidency of world football's governing body. Infantino also outlined his aims should he become Fifa president, saying he intended to expand the World Cup beyond its current 32-team format to 40 teams in a move similar to the growth of the European Championship from 16 to 24 teams. "It created a completely new dynamic in the qualification. It created new enthusiasm," he said. "If you are serious about developing football, it must involve more associations in the best football event in the world: the World Cup."